Long-running shows are rarely premeditated. Famous Door's legendary Hellcab was originally scheduled for five weeks in 1991, but instead ran continuously for just under ten years. Black Ensemble's 2002 season showcasing the great divas required two years to complete. More recently, Million Dollar Quartet had barely closed the curtain on its opening night in the Goodman's Owen before transferring to the Apollo for a record-breaking five years. So why should it be a surprise when American Blues Theater announced in May that their staging of Alan Janes' biomusical Buddy-The Buddy Holly Story would play throughout the summer and beyond Labor Day, all the way into September? American Blues first found itself faced with a don't-stop-the-music crisis in 2013 when ticket sales for its six-week production of Hank Williams: Lost Highway showed no sign of diminishing even when the company was forced to relinquish its room at the Greenhouse to the next renters thereof. Procrastinating playgoers were ultimately rewarded in 2014, however, with a remount drawing crowds for nearly two months. The experience informed American Blues' planning of its 2018 revival of Buddy Holly at Stage 773 during peak tourist season, says artistic director Wendy Whiteside, "To ensure accommodation, should it prove necessary, we were up front with the theater managers from the beginning about the possibility of an extension, as well as when hiring artists and negotiating licensing contracts." The wisdom of this foresight became manifest when performances began selling out as early as a week before the start of previews. Opening night confirmed the need for an "encore" presentation—a long one. Performers were warned to prepare for a lengthy residence in the Belmont Theater District. "An eleven-week run may seem a long haul, but we have an AEA Cat 2 contract, which means we do only five performances a week." Whiteside reminds us, "Actors are like athletes—they understand the kinesthetic demands of this kind of regimen and they've trained for it. Additionally, our cast has an amazing work ethic. Their genuine love of this music have made for magical nights"
These qualities were demonstrated during an occurrence in May, when a cast member fell ill only minutes before curtain, forcing the performance to be cancelled. Rather than send the audience home, the band—in a demonstration of generosity and what Whiteside calls, "just plain decency"—invited everyone to stay for a 60-minute live concert of hits from the composer's repertoire. So does this mean that Buddy Holly could keep rocking on and on? Whiteside shrugs. "Extensions are never guaranteed [but are] predicated on public response." She brightens as she recounts how, after a recent performance, a military veteran who had seen the show that night declared that its music transported him to a "higher place" akin to church or therapy, proclaiming "You never know how much an audience needs this show!" Other commitments on the part of the company members mandate the end of this particular engagement in September. Still, with that kind of public response, the music of an American pioneer (whose influence resonates globally to this day) at its source is unlikely to fade away. 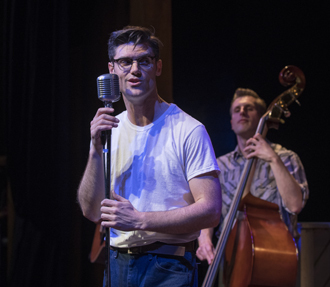 Buddy-The Buddy Holly Story continues its run at Stage 773 through September 15.